Welcome to the first installment of our new series titled, “Pushing the Limits”. This series will delve into a question we hear often at CUI, “What if I operate my power supply outside of a certain specification range?” To help answer this question, we will review common power supply specifications and outline the potential drawbacks and failures that could occur when operating a power supply outside of its specified limits. 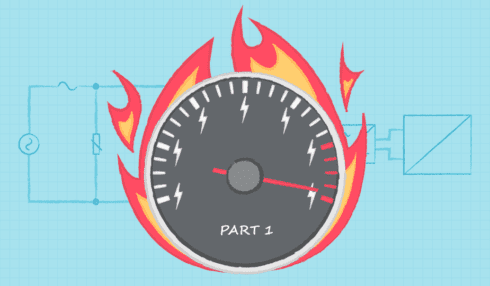 In Part 1 of this series, we will discuss the potential issues that can arise when the input voltage moves beyond a power supply’s allowable range. Throughout the world the available mains voltage and its associated stability can vary greatly, making it difficult to design a power supply that meets the input range needs of all applications. Assuming a power supply’s input specification is “close enough” to an application’s desired operating voltage can lead to failures if the power supply is in fact operated outside of its limits. These failures can be defined as either component failures, system failures, or specification failures, and each will impact power supply and system performance differently. Component failures occur when a component is damaged and/or no longer operates as intended. Applying a voltage that exceeds a component’s maximum operating voltage is a simple way to damage any component. Many components that are placed across the input, such as the X-capacitors, metal oxide varistors (MOV), and bridge rectifiers are easy to identify as being subject to voltage stress. If the input voltage exceeds their maximum operating voltage, the specific failure mode of these components can lead to a few different scenarios. For example, X-capacitors, which are designed to fail short for safety reasons, will likely open the fuse leaving the power supply inoperable. However, if Y-capacitors, which are designed to fail open, were to fail, the power supply may continue to operate, leaving users unaware that a failure has occurred. Other components, such as the fuse, are more difficult to identify as being susceptible to failure in the event of an over voltage. Under normal conditions, the fuse will appear as a short, and an increase in voltage will simply force the fuse to carry less current. If a failure, such as an X-capacitor short, occurs inside the power supply, the fuse will open and disconnect the circuit from the input source. However, if the maximum voltage of the fuse is exceeded and the X-capacitor shorts, the fuse will not be able to suppress arcing. This will fail to keep the circuit open leading to continued current flow through the failed capacitor, causing problems both up and downstream. In other instances, the voltage stress is related to parasitic components whose values are difficult to determine. The switch in a flyback converter, for example, has a peak voltage determined not only by the input voltage, but also the leakage inductance and turns ratio. In cases such as this, the voltage stress cannot always be determined by simply looking at the schematic or datasheets, but instead must be measured directly.